Late cancellation or No Show will be charge for the first night. Free cancellation 21 days prior to arrival. Name list on all participants 14 days prior to arrival. Minimum 1 nights payment 14 days prior to arrival. No refund after payment. There is a good selection of restaurants in the area around the hotel and a lot of trendy pubs and boutiques. Local transportation is just one block away. All rooms are fully equipped and there is also WLAN (wi-fi) available throughout the entire property. 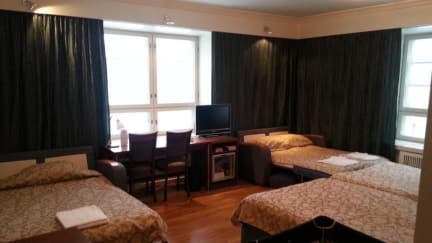 The hotel has 64 rooms, breakfast restaurant, sauna and a small meeting room for 12 persons and parking is available in a nearby garage. I liked this hotel very much and had a perfect stay. I can highly recommend to stay here. I enjoyed my stay and appreciated the helpfulness and courteousness of the staff. The location was great, and it was quite easy to find. I'd definitely stay there again. Great value hotel, centrally located with friendly staff an amazing breakfast buffet! It was fine. You’re getting what you paid for but nothing exceptionally good nor bad. Nice and clean room. A 10 minute walk to the major plaza and the harbour in the middle of the city. Breakfast was very nice - and they had take away cups for you to take a hot drink with you on the road, which was a nice touch. Had no problems with getting there from the bus terminal. 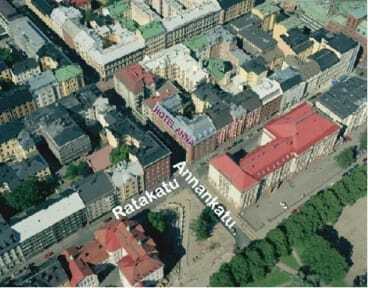 I would stay at this place again when I return to Helsinki.